TOYOTA TUNDRA FROM 2000 THRU 2004. WITH 4.7 LITER V8 ENGINE. (PLEASE INQUIRE IF YOU'RE NOT SURE). DEAR CUSTOMER: THE SMALL SQUARE GASKET IN THE PICTURE DOES NOT COME WITH THIS KIT. IT'S NO LONGER NEEDED TO REPLACE THE KIT. PLEASE DON'T SETTLE FOR AFTERMARKET PARTS. OUR POLICY IS VERY SIMPLE. THE BOX/BAG HAS TO BE IN GOOD CONDITION. CAN NOT BE RIPPED, MARKED OR HAVE ANY DEFECTS. THE PACKAGING CAN NOT BE DAMAGED. ELECTRICAL PARTS ARE NOT RETURNABLE. THE MAJORITY OF OUR PARTS COME WITH A. IF YOU HAVE A QUESTION REGARDING ANY ITEM, PLEASE FEEL FREE TO ASK US. 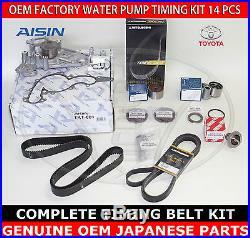 The item "TOYOTA TUNDRA 00-04 OEM COMPLETE TIMING BELT WATER PUMP 14 PCS KIT" is in sale since Monday, August 12, 2013. This item is in the category "eBay Motors\Parts & Accessories\Car & Truck Parts\Engines & Components\Timing Components". The seller is "metero1969" and is located in Clermont, Florida. This item can be shipped worldwide.